This entry was posted in Community Notices, Education, Gallery, General, Recent Happenings, Services, Sport, Recreation & Leisure, Upcoming Events and tagged announcement, Balla, Belcarra, Catholic Church, church, community, community notices, events, happenings, happenings Church, mass, Mass (liturgy), masses, Mayo, news, notices, organisations, Parishes, Pastoral Council, sacraments. 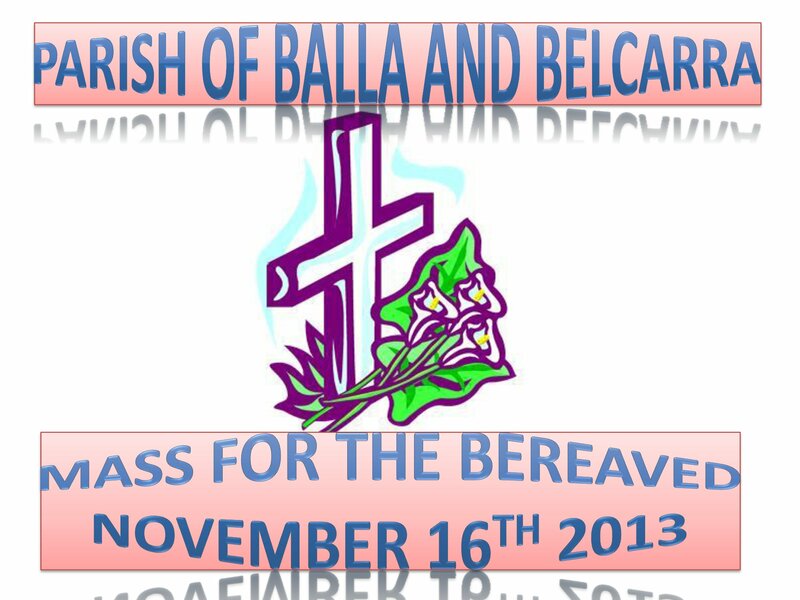 A special Mass for the Bereaved will be celebrated on Saturday November 16th. All in our parish who have suffered a bereavement during the last twelve months (locally or elsewhere) are invited to come along to the Mass. It is an opportunity for all in the parish to come and show their prayerful support for all who have been bereaved.The Pastoral Council would like to encourage as many as possible to attend. This entry was posted in Community Notices, General, Uncategorized and tagged Balla, Belcarra, church, community, community notices, deaths, events, mass, Mass (liturgy), Mayo, newsletter, notices, parish, Parishes, Pastoral Council.